조선 초기의 전형적인 매병으로 구연이 그대로 외반되고 어깨가 원과 같이 둥글며 허리가 가늘고 아랫부분이 넓게 벌어진 형태를 하고 있다. 몸통전체를 상단ㆍ중단ㆍ하단으로 나누고, 어깨 부분인 상단에는 변형된 연판문과 그 밑에 넓게 펼쳐진 여의두문대를 둘렀다. 넓은 몸통의 중단에는 얼굴은 용의 모습이며 물고기의 몸통을 한 어룡을 2군데에 새기고, 그 사이에 연화절지문과 작은 물오리들을 새겨 넣었다. 어룡과 같은 신비로운 소재와 연꽃과 물오리와 같이 일상적이며 서정적인 소재를 함께 배치하여 독특한 분위기를 자아내고 있다. 유약은 맑고 투명한 엷은 담녹색을 띠고 있으며, 유층에는 균열이 없고 광택은 은은한 편이다. 굽은 평평하지만 전체적으로 중심부가 약간 오목하게 들어갔으며 희고 굵은 모래를 받쳤던 흔적이 남아 있다. 형태나 문양소재, 상감기법 등 고려청자의 전통을 그대로 계승하였지만 표현 방법에서 새로운 조선시대의 특징이 나타난 상감문양이 새겨져 있는 대표적인 작품이다. This vase is a classical early Joseon prunus vase with a sharply flared out mouth rim, round shoulder and a slim waist which flares out to a wide base. The body of the vase is divided into three tiers: a top, middle and a bottom tier. The top tier near the shoulder is ringed with a band of lotus petal motifs of an atypical style, and a wide band of yeouidumun, swirling cloud-like motifs, is placed beneath it. The middle tier displays a dragon with the body of a fish in two places, and in the spaces in-between, lotus flowers with stem and foliage and small duck motifs. 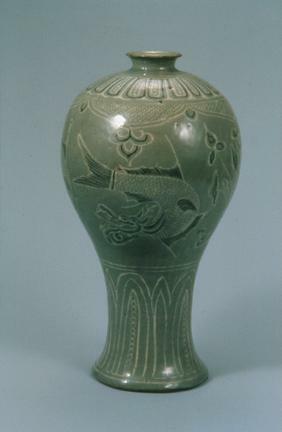 The combination of a mythical image like a half-fish half-dragon creature and such lyrical yet ordinary motifs as lotus flowers and ducks creates a unique atmosphere for this vase. The surface, coated with a clear glaze with a light green hue, shows no crackles and has a soft glow. The rimless foot is slightly concave in the middle, and traces of having been rested on a bed of large-grained white sand for firing are visible on the underside. This vase with inlaid decorations, while inheriting the style of Goryeo celadon prunus vases in terms of underglaze motifs and inlaying technique, also embodies characteristics that are proper to the Joseon Dynasty.